Fall, Fall, Fall ... I love fall! ... And I love dressing for Fall. I remember owning a pair of faux leather pants in my childhood, I never wore them, 'cause I never knew how to wear them. Then again, why did I have leather pants in the tropics? I suppose just like the lil' frilly bobby socks ... some things can't be explained! Anyway this season, leather is in! .... And it's growing on me. 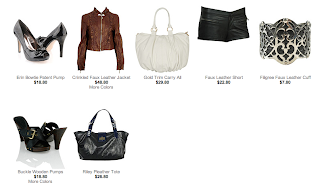 Forever 21 has various faux leather goods. So here are some suggestions to work leather into your wardrobe this season! 2. Pair leather with Lace Leggings. Leather and lace are a bold but wearable combination. 3. Berry and brown tone accessories or jackets. 4. Cashmere provides great contrast to leather.